Compass :- 5.5 x 1.5cm & Compass Dia:- 4.5cm.& Box Size:- 6.5 x 6.5 x 3.4cm. We are one of the distinguished manufacturers, exporters and suppliers of all kinds of Antique Brass Compass. We use superior quality base material to ensure durability and reliability. Our team of experienced and sincere personnel works persistently to manufacture high quality instruments for our clients. 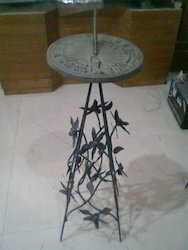 With the aid of our hardworking professionals, we are offering Silver Sundial to the clients. Our range of this Silver Sundial is at par with the predefined parameters of the industry. To add on, this Silver Sundial could be availed at pocket friendly prices. Keeping in sync with the latest market norms and policies, we are indulged in providing a high-quality range of Brass Garden Sundial. We are a credible Brass Sundial Manufacturer and Exporter from India, catering to the world wide customers. The use of solid brass material in the fabrication of Brass Sundial brings repeated orders for the products. 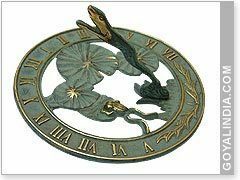 The Brass Sundials are made available at pocket friendly prices. Sundials are classic garden ornaments, but they're more than just decorative items they're useful and educational, too. Sundials are excellent table top items adding elegant touch to the home decor. These sundials have well-polished surface and adjustable tripod. A great gift idea as well as an item of actual use. These nautical sundial are available in a variety of designs and sizes for our clients to choose from. The compasses offered by us can also be customized according to the specific requirements of our clients. The nautical pocket sundial compass. This is a beautiful solid brass antique reproduction of a sundial with an internal magnetic compass. With immense market knowledge, we have been able to provide optimum quality Sundial Clock.